It is illegal to buy, sell, trade, or own an endangered animal in Vietnam. Nevertheless, the "Exotic Animal Market" is a prominent and permanent structure in the middle of Saigon and even gets listed in the tourist guidebooks. Most animals in the market are infants. The hunters catch them by shooting the mothers and gathering the young. This decimates the population of breeding females. A bear is worth about $3000 on the open market - $1,500 for its gall bladder and $1,500 for its meat and skin. The average Vietnamese farmer makes about $200 per year off of his fields. How to cook a monkey for "medicinal purposes" - Put it in a pot and boil it for three days and nights. Once the liquid has the consistency of hot asphalt, decant it, cool it, and drink it in small quantities to cure a variety of aches and pains. An endangered gibbon sells for about $150-200 on the black market. An endangered langur costs $400-500. Langurs are expensive because they rarely make it to the market alive - their stomachs can only digest leafy greens. Poachers give them cookies and bananas to eat, and within a few days they sicken and die. The biggest danger to Vietnam's endangered animals is deforestation. Vietnam only has 10% of its first-growth rainforest left, and even that is dwindling fast. As Vietnam's animal population starts to dry up (from both poaching and deforestation) Cambodia is increasingly tapped for its endangered animals. Many animals are born and caught in Cambodia, smuggled into Vietnam, and shipped to China. Animals caught north of the DMZ are most likely to go to Hanoi/Haiphong and get shipped by truck to China. Animals caught south of the DMZ are likely to go to Saigon. If they are not consumed domestically they are shipped to China by sea. Vietnam has a department under the Ministry of Forestry that deals in forest products - wood, honey, mushrooms, animals. They need the cooperation of the hunters to get a steady supply of animals for sale and export. They are afraid that if they clamp down on the endangered animal trade the hunters will no longer bring them legitimate products for export. Despite the large number of endangered animals crossing the border into China, Vietnam does not officially allow any of its endemic animals to leave the country - so foreign zoos cannot stockpile its dwindling endangered species. Not too long ago the Hanoi zoo negotiated a temporary animal exchange - the Hanoi zoo got three European zebras and a wild horse in exchange for some Vietnamese elephants. Within a few weeks the first zebra was dead. Then the second. Before long all the zebras and the horse were dead at the Hanoi zoo. The elephants took up permanent residence in Europe. After the discovery of the sao la in Vietnam, three live specimens were captured (one an infant). 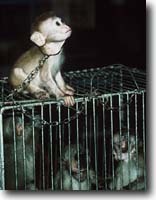 They were all immediately taken by the Vietnamese government and sent directly to the Hanoi zoo. All were dead within six months. The Hanoi zoo has placards above all of the animal cages, explaining each animal's name, habitat, life span, breeding habits, and usefulness to man. "Pharmaceutical value" is listed under almost every animal. The following story tells of my experience rescuing four leopard kittens an endangered gibbon and a serpent crested eagle from the animal market and a miracle that happened.